Sen. Edward M. Kennedy, 1932-2009 Sen. Edward M. Kennedy of Massachusetts — the scion of an American political dynasty who became an iconic liberal legislator — died Aug. 25 after battling brain cancer. Universally known as Teddy, he had served in the Senate since 1962. The scion of an American political dynasty and iconic liberal legislator died Aug. 25. August 30, 2009  Hundreds of people visited the grave of Sen. Edward Kennedy at Arlington National Cemetery, a day after he was laid to rest. Feelings of sorrow and admiration were shared by the mourners, regardless of age, race or nationality. August 29, 2009  Sen. Edward M. Kennedy was buried at dusk Saturday during a private ceremony at Arlington National Cemetery, joining his slain brothers on their hill. His wife, Victoria, whom many credit with helping Kennedy remake his life and legacy, received the American flag that had draped her husband's coffin. August 29, 2009  Sen. Edward Kennedy's body was flown from Boston to Washington, D.C., Saturday afternoon for burial across the Potomac River in Arlington National Cemetery. August 29, 2009  America — its presidents, its senators, its people — said a final goodbye to Sen. Edward Kennedy on Saturday. Mourners braved a downpour to attend the funeral Mass for the late senator at Boston's Our Lady of Perpetual Hope Basilica. August 29, 2009  President Obama delivered the eulogy for Sen. Edward Kennedy at Our Lady of Perpetual Help Basilica in Roxbury, Mass., Saturday. August 28, 2009  Niece Caroline Kennedy and nephew Joseph P. Kennedy told mourners at the memorial service for their uncle Edward that "Teddy was always there." "He taught me to be a better senator," said GOP Sen. John McCain, one of several Senate colleagues to pay tribute to Kennedy. August 28, 2009  Sen. Edward Kennedy's funeral will be held this week at Boston's Our Lady of Perpetual Help. The basilica is in a neighborhood with a rough reputation, but the church was dear to Kennedy, who prayed there every day while his daughter was battling cancer at a nearby hospital. August 28, 2009  Thousands of people lined up at the John F. Kennedy library in Boston to bid farewell to Sen. Edward Kennedy. The crowd included people who had never met Kennedy and dignitaries who knew him well. August 28, 2009  Sen. Edward M. Kennedy was buried Saturday, Aug. 29, during a private ceremony at Arlington National Cemetery. Earlier in the day, family and friends gathered for a funeral Mass in Boston. August 28, 2009  Sen. Edward Kennedy's death effectively ended the Kennedy political dynasty. Although Kennedy's son Patrick is a member of Congress and Bobby Kennedy Jr. is an outspoken advocate of causes, others in their generation have shunned politics. And those who did hold office have lost their seats, retired or died. 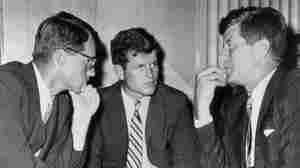 August 28, 2009  Funeral services for Senator Edward Kennedy will be held in Boston on Saturday. Later, Kennedy's motorcade will stop at the U.S. Capitol for a brief prayer. Kennedy called Massachusetts his home, but Washington D.C. was just as much his home. The senator made his mark on the nation's capital with his hard work on issues and his force of personality. August 28, 2009  Thousands of people have lined up to file past the casket of Senator Edward Kennedy. His body is lying in repose at his slain brother's presidential library in Boston. The senator's widow Vicki Reggie Kennedy was one of dozens of family members, who came outside to greet people standing in line after dark. August 27, 2009  The body of Massachusetts Democratic Sen. Edward Kennedy made its way Thursday from Hyannis to Boston. It will lie in repose at the JFK Library in Boston until a weekend funeral. August 27, 2009  The Kennedy family gathered at its seaside home in Hyannis Port, Mass., on Thursday for a private Mass to mourn its patriarch, Sen. Edward Kennedy. Three days of tributes will culminate with his burial near brothers John and Robert on Saturday at Arlington National Cemetery. August 27, 2009  Over nearly five decades, Sen. Edward Kennedy assumed an important role in framing the nation's civil rights laws and leading the opposition to Supreme Court nominees he viewed as hostile to civil rights.